My native language is Hindi or more of Hindustani with a mix of Hindi and Urdu. I am not really ashamed to accept it like many people are. Someone once told me that it’s really nice to be ESL. There are some stories which connect with you in the home tongue only. This is a review of the Hindi book. 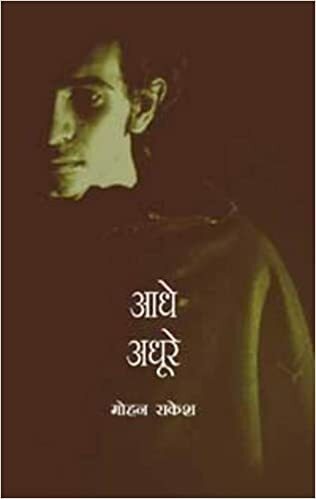 Some time ago I watched a play called “Adhe-adhure”. The play was enacted during some theater festival. I was still new to play then. All I knew was that it is going to be a melodrama and that the play has been played by different actors since 1950. That’s really a long time for a story to survive. Another important fact of the play was that the one male actor played the role of five characters. Sounds intriguing, yes? That’s what pulled me to the play. Amidst the darkness of the theater, I was sucked into the story and left gasping at the end with a question of “is this the end?” and yet with a lingering relief that the writer ended the story on the right note. The story was of a woman who is trying to find her completeness in different men. The family is rife with strife. The kids have grown up in the midst of arguments. The story showed a married daughter returning to that angst-ridden home to find out what was that thing that she took from her home that keeps her from being happy? What’s that thing which bothers her even if everything is going fine with her husband and at her home? It has been months since I watched the play. I had even forgotten the name of the play and actors. But those dialogues stayed in my mind. As if buried in my subconscious, at times, their bones rattled in my mind. I did not remember the complete dialogues, but yet I could smell them in my thoughts. It was like the smell of the sulphur in the chemistry lab of my school which just refused to leave me alone. I washed and washed and washed, but sometime or the other, it will be there again. I wanted to know the exact wordings, the exact lines that were said. Then I started hunting for the name of the play again. Checked the schedule of NCPA. Checked newspaper articles of that time. Conferred with the friend who accompanied me. Singled out the director’s name, Lillite Dubey. And then Googled. Finally, I had the name. Aadhe Adhure. Incomplete, it means. I needed to know that dialogue. It was like I was incomplete. So I went on and searched for the screening of the play. No success as the play was re-enacted once as a tribute to the original play. But there was a book. A script of that play. I just checked to see if the book was in Hindi because I was sure English translation won’t have the same effect. It just can’t hit you that hard. My purchase was made once I was sure that the book was in Hindi. It was a book whose story I already knew, already understood, yet reading it left me gasping once more. The whole story was verbatim same; I could see the actors playing the roles, yet it was a different experience. I had the heightened awareness of the dialogues and nuances presented in the story. When I came to that dialogue, I almost cried with relief. And when I reached the end, I raged at myself. How could I not see the male chauvinism in the play? How could I read something which saw women as such? The play ends in the dialogue in which husband’s friend tells the wife that she is the one who is responsible for the pathetic state the main male character is in. Then comes my anger on why the writer didn’t seem to understand the plight of the women, the question on why didn’t writer delve into the character to understand the wife’s motivation and her reasons for discontentment. Overall, it is a book which left a sour taste in my mind, but it is something which I will read again and again and again. Masterful dialogues. This is a play, and dialogues have to be effective for it to be successful. But the exchange of dialogues in the play is amazing. The unbalanced scales of attitude towards men and women. The story leans strongly in favor of men. Everything is blamed directly on the women. This fact has been identified in the introduction of the play as well, but the fact that it is there doesn’t go unnoticed till the end. Probably I did not notice it during the play because of the actors’ judgment and sympathies towards the women, but it is glaring in the book. I will give this book five stars. Everything in it is masterfully executed. Despite my anger and my hatred towards the treatment of women in the story, I loved it.